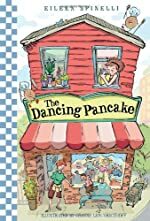 Review: Humorous, sad, and dancing are three words that describe one book titled The Dancing Pancake, written by Eileen Spinelli, and illustrated by Joanne Lew-Vriethoff. The Dancing Pancake is about this girl named Bindi who is having trouble with her life. Her father has left her with her mother so that he could start his life over again. Noah Adams, who Bindi has a crush on, has moved. Her friends don’t spend as much time with her as before, and she has to move, again! Bindi can’t control anything, and it’s starting to get on her nerves. She can’t take it anymore. All the advice everybody is giving her isn’t doing her any good. Can she get everything control, or is everything going to take control of her? Read the book to find out. The Dancing Pancake is a funny book, and I couldn’t put it down, until I got to the end. My favorite part of the book is when Mrs. Otis (a very crabby costumer) orders two eggs, over easy, and a just crisp piece of bread. And when she bites into the eggs, Jackson’s fake spider Inky jumps out of the eggs and make Mrs. Otis mad. As she stomps out of the breakfast & lunch restaurant, she yells to everybody who works at The Dancing Pancake “You are all in big trouble now! I’m calling my son, Toby. He’s a big lawyer. He’ll inform the Board of Health about this revolting incident…” This was my favorite part because it made me crack up. I almost fell of my bed, and I’m not kidding. This book is another book I think should go in everybody’s summer reading list. This is because it is, as I said many times before, humorous. And nobody can resist dancing pancakes. This is why it is a really, really good book. I hope Ms. Spinelli writes a sequel to this book, it would be really cool. And I have also established that I will read 3 or more of her book because I like the way she writes. We would like to thank Random House for providing a copy of The Dancing Pancake for this review. Have you read The Dancing Pancake? How would you rate it?